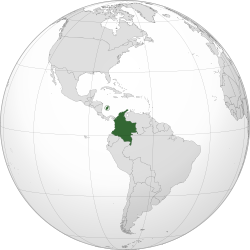 ↑ (ਸਪੇਨੀ) Constitution of Colombia, 1991, Article 10. ↑ (ਸਪੇਨੀ) Colombia a country study, 2010, pp. 86, 87. ↑ 3.0 3.1 "Animated clock". Colombian State Department. Retrieved 4 February 2012. ↑ 4.0 4.1 4.2 4.3 4.4 "World Economic Outlook Database". International Monetary Fund. April 2012. Retrieved 11 September 2012. ↑ The Geographer Office of the Geographer Bureau of Intelligence and Research (15 April 1985). "Brazil-Colombia boundary" (PDF). International Boundary Study. Retrieved 5 January 2008. ↑ CIA (13 December 2007). "Ecuador". World Fact Book. Retrieved 5 January 2008.